I remember when I was young and my mother would ask which Dal you would like to eat today, our reply used to be the 'black Dal', 'green Dal', 'yellow Dal', 'pink Dal', 'white Dal' and so on. There are so many types and varieties of Dals and sure we didn't know all the names. But, it was a daily question. Dals are prepared everyday in a typical desi home and flour made from Dals is served in the form of sweets, snacks or savories on all occasions. You probably guessed that I basically come from a Dal-roti type of family (primarily vegetarian). My father always said "saada bhojan, oonche vichar" (simple living, high thinking). Not that he ever stopped us from eating anything but we all grew up with that faith. To this day, my meals are incomplete without Dal, whether I am cooking only for us or when I am hosting. A myth that only meat can give you proteins, is so wrong. Dals (lentils) are the excellent source of high-quality protein and much easier to digest than meat. I am not propagating vegetarianism but we definitely have a choice. Clean and wash Dal. In a pressure cooker fry varia with one tablespoon ghee for 2 minutes. Add Dal, water, turmeric, salt and chili powder. Close cooker and cook on high. When pressure builds up reduce heat to medium and cook for another 10 minutes. In a small pan, fry cumin with ghee. Mix garam masala and pour it on Dal. Serve hot. It is one of the few things I knew when I got married and I can proudly claim that I make it exactly like my mother. Wash Dal. In a pressure cooker mix Dal, water, salt, haldi and chili powder. When pressure builds up reduce heat to medium and cook for 8 minutes. It takes 1 whistle in Hawkins pressure cooker. Do not take the steam out. Take ghee in a small pan and fry cumin. Mix onions and keep frying till they turn light gold. Now add ginger and garlic. Once garlic starts smelling, add tomato and cilantro. Cook until the mixture becomes a smooth paste. Add garam masala and pour this mixture on Dal. Stir and serve hot. The recipe below serves 12 people. Many of us are living in U.S. away from our families and we don't need to cook such large quantity everyday. I have used larger portions for this Dal on purpose. I always freeze half the quantity when I cook this Dal. It takes so much time to prepare and in our hectic lives when we are always juggling and running between things, it makes a lot of sense to cook twice as much as you need (not everything!) and freeze it immediately for use at a later time. It tastes just as good. Clean and wash Sabut Maa and Rajma. Put Dal and beans in a pressure cooker and add water, ginger, tomato, garlic, salt and red chili powder. Place cooker on maximum heat and bring it to full cooking pressure. Now reduce the heat to medium low and cook for an hour. Do not take the steam out and leave the pressure cooker to cool gradually. In a pan fry onions with butter till golden. Add tomato paste and sour cream. Cook for three minutes or till butter separates. Now put Hing and garam masala. Fry for another minute and pour the mixture into Dal. Just before serving add the remaining stick of butter to the Dal. Serve hot with chapati or naan. Another method to prepare Dals is to put them in slow cooker and forget about them. When I was working, I used slow cooker at least three times a week but now that I am at home, I don't use it as often. Using slow cooker is a habit and some people swear that Dals taste much better. I leave it to you to judge that for yourself but I do recommend that you cook beans in slow cooker when you are entertaining. Consider it a tip for saving time and focusing on other dishes when you have too much on your hands. Clean and wash sabat maa and rajma. Put Dal and beans in slow cooker and add water, ginger, tomato, garlic, salt and red chili powder. Place cooker on high and cook overnight (about 8 hours). In a pan fry onions with 1 stick of butter till golden. Add tomato paste and sour cream. Cook for two minutes or till butter separates. Now put hing and garam masala. Fry for another minute and pour the mixture into Dal. Clean and wash Dal. In a pressure cooker, put Dal, water, ginger, garlic, turmeric, salt, chili powder and close. Place cooker on maximum heat and bring it to full cooking pressure. Now reduce the heat to medium and cook for 8 minutes. Do not take the steam out. Let it cool gradually. Meanwhile, heat oil in a frying pan. Fry cumin and turn off the heat. Now add green onions and garam masala. Since the oil is hot, onions will get cooked a little. Pour this mixture on Dal and stir. Give Dal another boil and serve hot. Clean and wash Dal. In a pressure cooker mix Dal and water and cook on high. When steam builds up, reduce heat and cook on medium for 15 minutes. Do not take the steam out. Let the cooker cool gradually. In a pan, take ghee and saute' onions and cumin until gold. Add tomato and sukhi methi and fry until smooth. Pour this mixture on Dal and mix well. Serve hot. 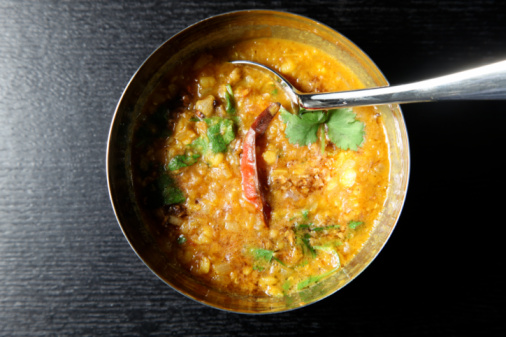 This Dal is a mix between Sambhar and traditional Dal. It is one of the quickies when you are short of time. To really enjoy its taste, serve it in a bowl and add rice but only half the quantity of Dal. That's how I like it and I hope you will like it too. Wash Dal. Boil it in a pressure cooker with tomato, haldi, salt & chili powder on maximum heat. When steam builds up, reduce the heat to medium and cook for 10 minutes or 2 whistles in Hawkins pressure cooker. In a pan heat oil and put mustard seeds. When they start springing, add onions & garlic and fry till golden. Now put Hing, sukha dhania and garam masala. Pour this mixture to Dal and add lemon juice. Hi ...Im from Dhaka, Bangladesh. You have an interesting blog. I have enjoyed reading the section on dals. What is Varia in your channa dal recipe? can it be made at home - if so how? Fantastic food, sensational recipes, wonderful instructions. I am so glad I found your page.